All photos courtesy of D'USSÉ. When it comes to the subject of lost pre-Prohibition spirits in classic cocktails, rye whiskey tends to hog the spotlight. However, flip through a book such as Hoffman House Bartender’s Guide by Charles Mahoney published in 1912, or the perennial favorite, The Bar-Tender’s Guide or How To Mix Drinks by Jerry Thomas (1862, 1887), one will find a multitude of brandy based cocktails. It might be of some surprise that drinks with brandy were an essential part of a bartender’s repertoire - beyond the obvious Sidecar and Crusta. (By the way, if you can’t access a hard copy, you can view these books and many others by visiting the EUVS Digital Library and other online sources for bartenders for free digital archives.) Either the ingredient in the recipe is listed as “brandy” or “old brandy,” but unless a specific fruit such as apple is mentioned, that brandy in the drink is probably Cognac. Even cocktails we now associate with other spirits such as the French 75, Sazerac and Julep were adapted from brandy recipes. In the recent cocktail resurgence, brandy appeared to have gotten lost in the dust of whiskey, gin, rum and the trendy rush of agave spirits as a go-to cocktail ingredient. That’s finally beginning to change, especially as Cognac blends such as those from the new modern label D’USSÉ have been created with cocktails in mind. Last month, the XO expression won gold in the 2016 NY International Spirits Competition, chosen in a blind tasting among judges who are influential New York City bartenders and beverage directors. As part of their daily life, these professionals are constantly revisiting old recipes and come up with new ones for their customers. The accolade for D’USSÉ comes at a time when cocktail-friendly Cognac blends are now finding their way on menus around the world in intriguing combinations. 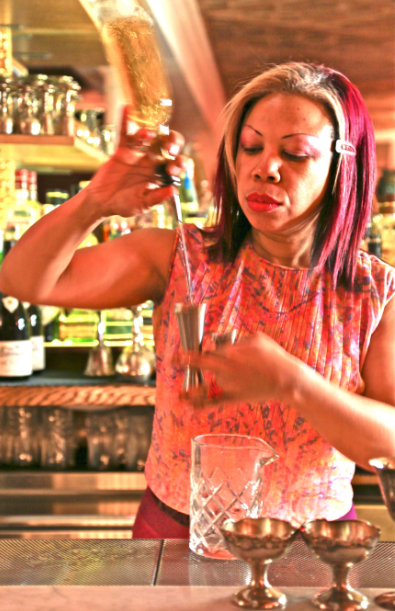 Franky Marshall is the beverage director at the stylish underground parlor Le Boudoir in Brooklyn Heights. The bar was designed as a reimagining of Marie Antoinette’s bedroom, where guests could be received and entertained (the bar even has a cabaret license to allow for live piano music on Mondays and weekend DJ dance parties). Well educated on the subject, having visited several Cognac distilleries, Marshall has a special place in her heart for Cognac cocktails. It made sense to focus on a few for this venue. Here she answers a few questions and provides some tips on incorporating Cognac into drinks, along with fellow industry expert Colin Asare-Appiah. Amanda Schuster: Although Cognac is one of the original ingredients in classic cocktail recipes such as the Sazerac, why has it taken so long to find its stride in the cocktail revival? Franky Marshall: There are a few factors, but I think that for a long time people were mostly familiar with the XO category and considered it a luxury ingredient and/or a spirit to be sipped after dinner. There was not that push that we are now seeing from the BNIC and brands to educate the trade and consumers. Also, now we have a multitude of expressions and ages of Cognac available at price points that make it feasible to once again include in cocktails. Colin Asare-Appiah: The brown spirits renaissance led by whiskey has inspired greater interest in Cognac. Bartenders are embracing it as the original ingredient in cocktails, like the French 75 and also a re-introduction to after-dinner cocktails such as the Stinger and Brandy Alexander are driving the increase in Cognac awareness. New ultra-premium brands such as D’USSÉ are generating a lot of interest in the category. AS: What are some of the fruit flavors that you find best compliment the nuances of Cognac, and are there other ingredients that people might find to be a surprising match? People don't always think of having Cognac with a meal, but Cognac is very food friendly. Things like oysters, caviar, smoked herring, blue cheese, foie gras... The key, as always, is to pair the foods with the proper category. As always taste and try, the combinations are endless. CA: There is a wide spectrum of flavors across all cognacs from coffee, candied fruit, dry apricot, almond, milk chocolate, to orange blossom, coffee, sandalwood, dried fig. These flavor profiles allow you to mix Cognac in a lot of different ways . Pineapple Juice, coconut water, almond milk are all easy ingredients to pair. I recently tried a cocktail that contained D’USSE VSOP cognac with carrot Juice and fresh ginger syrup, it is surprisingly refreshing. AS: There are certain ways bartenders introduce spirits to newbies. For instance, those interested in trying whisky for the first time need a little hand holding to find their direction. How do you present Cognac to people who have an interest, but haven't tried it before? Is it better to serve it neat, or do you start them off with ice or other ingredients? Is it better to start with a younger or older expression? FM: Well, this depends on the guest and what kind of drinker they are. Do they like neat spirits or prefer mixed drinks? If they enjoy sipping spirits, then definitely an older expression, an XO, served neat with perhaps a little water on the side to bring out further nuances and flavours. If they prefer lighter drinks, then I might offer them a Cognac and Ginger highball, or a French 75. I would always give them a taste of the spirit neat so they can understand what they're tasting. CA: Whenever introducing Cognac to a newbie, I always start them off neat with water and ice on the side. I think it's important to try the spirit neat, then add a little water to allow the spirit to bloom and open up, and lastly, ice as temperature will change the flavor profile again. This way, you have the opportunity to try the spirit through different stages. I normally use D’USSÉ XO this way as it really allows the complexity of the spirit to shine. AS: Finally, what's the best Cognac drink for a fan of the stirred, bitter and boozy? Or for those preferring something on the fruity side that isn't a Sidecar? FM: Staying with classic, easy to execute cocktails: for a long drink, try a VS Cognac Mojito. For the stirred/boozy drink, VSOP or XO Cognac Sazerac should do the trick! CA: An Old Fashioned with Cognac and a Brandy Cocktail (Cognac and Curaçao) are beautiful cocktails for those who like their drinks boozy. The cocktail such as a Code which contains D’USSÉ VSOP, pineapple juice, amaretto and bitters is a real crowd pleaser and simple to make. 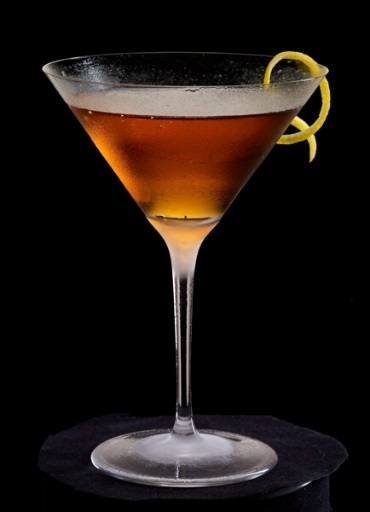 Vieux Carré - let’s start with a classic, named for New Orleans’ French Quarter neighborhood. Combine all ingredients in a mixing glass and stir with ice until well chilled. Strain into a rock’s glass with a large ice cube or serve straight up. Express and add the lemon peel. Botequero, a soothing cool weather warmer. Combine all ingredients in a mixing glass. Heat a brandy glass by filling it with hot water. Drain just before serving, then strain the ingredients into the glass. Garnish with a fresh orange peel and cinnamon stick. Combine all ingredients in a mixing glass with ice and stir gently. Pour into a tulip glass. Garnish with edible flowers if feeling fancy.